Dealer politics and hype-driven used values aside, there are few criticisms to be made of Porsche GT product. But you knew that already. The purple prose lavished on anything bearing a GT3 or GT4 badge is such that any crumb of imperfection is feasted upon by those attempting a vaguely objective sounding critique. 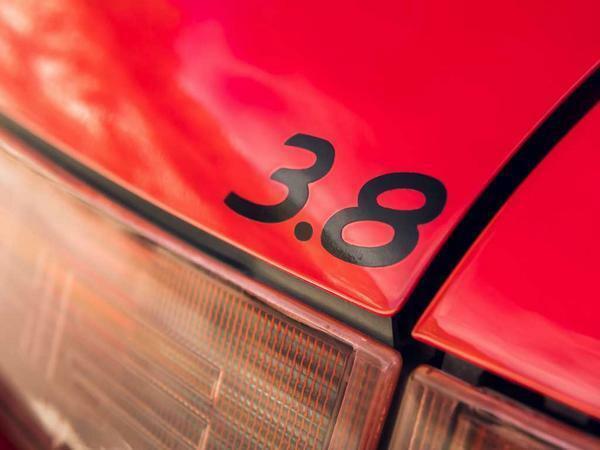 Hence the fixation with overly-long gearing, or frustration that tickling the rev limiter in any modern Porsche puts you well beyond real-world 'points not ban' pace. First-world problems, perhaps. But ones that Californian Porsche tuner Sharkwerks has made a mission of addressing. Tap #sharkafied into your preferred social media platform and the MO is obvious, signature mods focusing on stuff like revised gearing, lower final drives, lightweight flywheels, loud exhausts and the kind of tweaks that would let any GT3 or GT4 owner enjoy more of their car's abilities, more of the time. Critical acclaim and a loyal following have been the reward, hard-driving canyon culture being as relevant to British tastes as it is Californian ones. 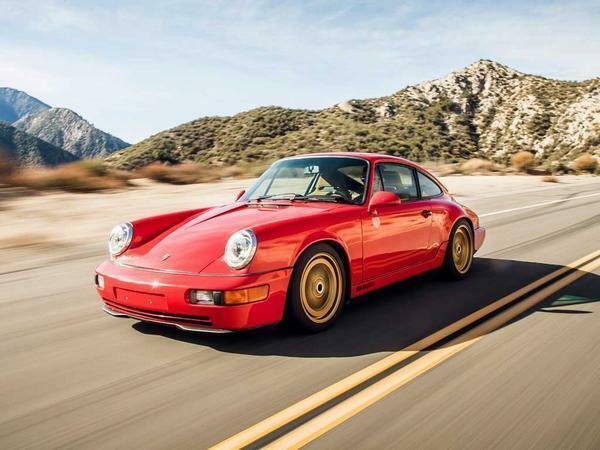 Yet even this hasn't silenced nagging doubts among Sharkwerks staff and customers that, just perhaps, modern Porsches can be a bit much for the environments in which most of us can realistically use them. 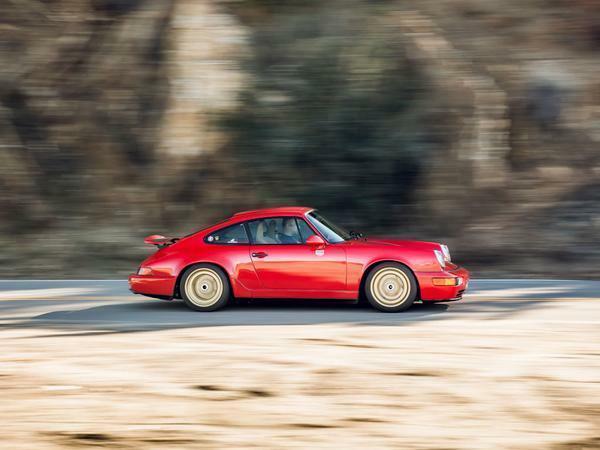 Could the formula of close-ratio 'boxes, torque-enriching capacity bumps and Sharkafied handling bite be applied just as effectively to air-cooled 911s as it is to 996s and 997s, then? 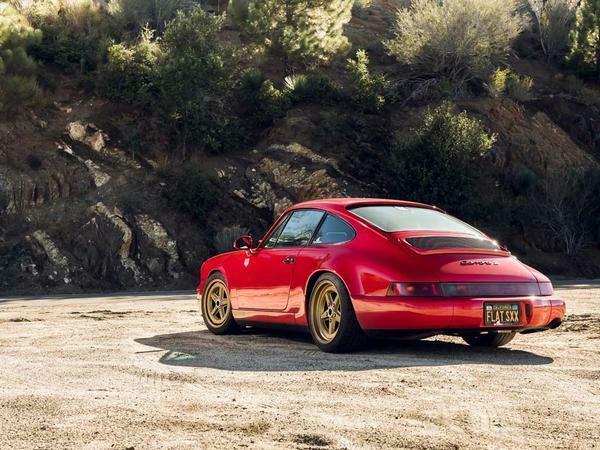 The 964 you see here belongs to Sharkwerks co-founder Alex Ross who, along with seemingly most of the Californian Porsche community, is an ex-pat Brit. 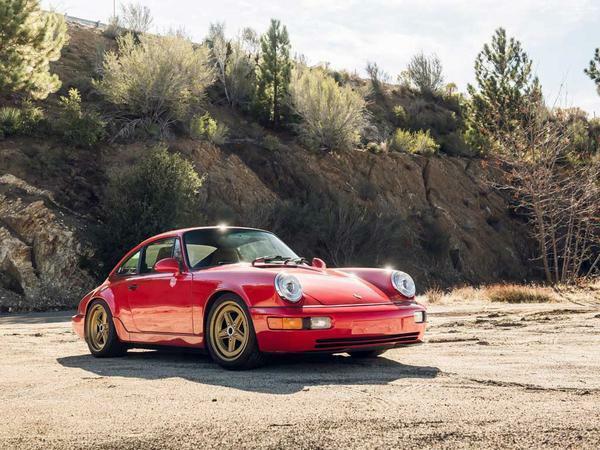 Like contemporaries Magnus Walker and Singer's Rob Dickinson, his Porsche habit started as a personal passion and has evolved into a business, the Sharkwerks ethos sitting somewhere on the spectrum between Walker's shabby chic and Singer's obsessive perfectionism. 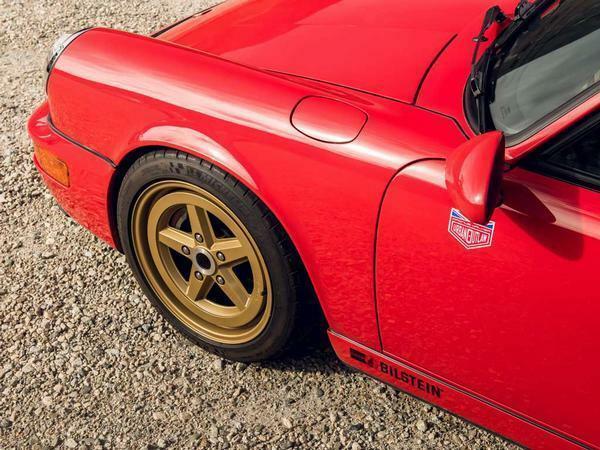 Walker is a long-time pal, stickers on the wings and a set of his rather tasty fifteen52 Outlaw 003 wheels giving Ross's otherwise stock-looking Carrera 2 a garnish of Californian style. For all that it says much about the Sharkwerks mentality: that the real interest in this car is in the way it goes, rather than the way it looks. 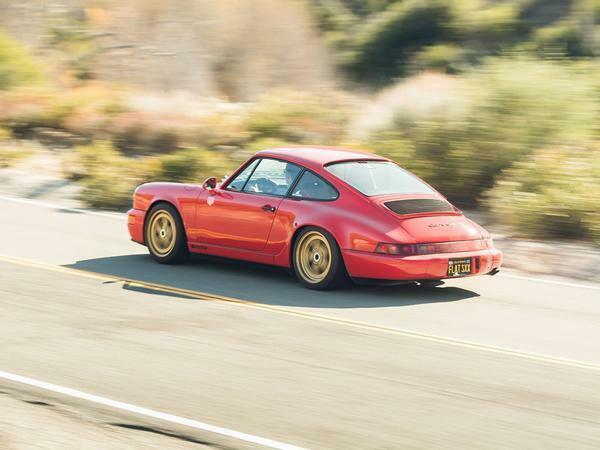 Inspired by the fact that the 964 RS America is, in Ross's view, "a rather sad 'tweener" compared with the real thing, he set out to turn his stock Carrera into something a little sharper. Out went the power steering for starters, track-spec Brembo Club Race brakes and Bilstein B16 struts replacing the stock kit and providing a platform for the engine mods to shine. 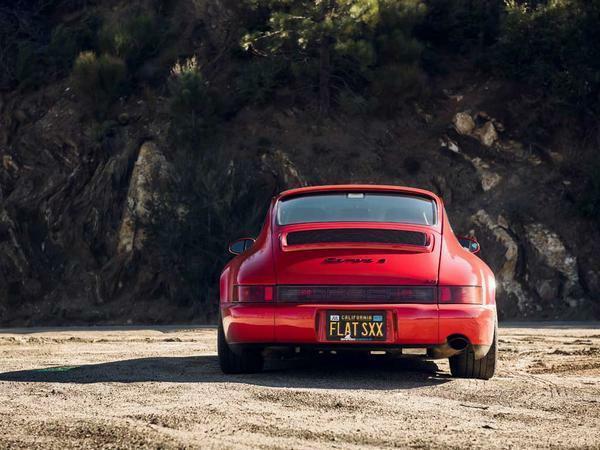 While not as dramatically pared back as a factory 964 RS, a weight saving of around 60kg is a step in the right direction. 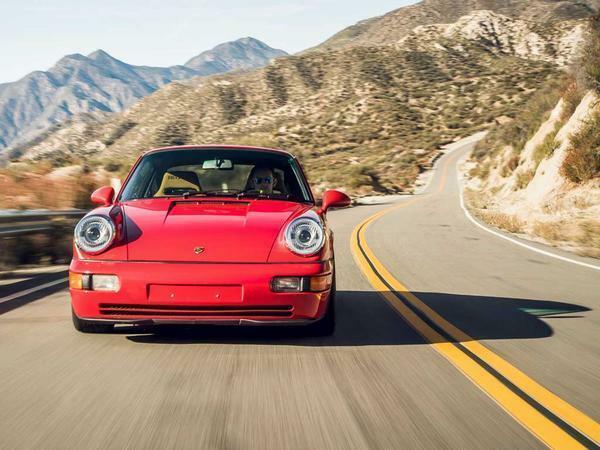 In standard form the 964's 3.6 manages a fairly relaxed 250hp, the Sharkwerks engine upgrades focused on increased power and reduced inertia. New pistons increase swept capacity to 3.8 litres while leaner conrods and a lightweight GT3 RS 4.0 flywheel and clutch pressure plate contribute to the new-found zing. 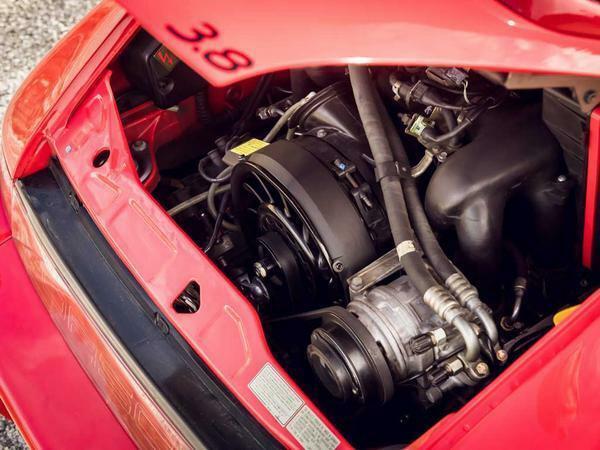 Such is the transformation that the original 90s engine management is left flagging, the solution to prevent embarrassing hesitation or constant stalling being a custom-programmed modern ECU to control fuelling via a new harness, sensors and injectors. The result is about 340hp on US fuel, a Guard limited-slip diff and custom gearing that bundles first to fourth together but leaves fifth as a cruising gear putting it all to the road. And that's it, Ross putting the total cost of the package as seen at around $60,000 on top of the donor car, though a tenth of that will get you close to 300hp with the electronic upgrades alone and is a popular standalone mod. No gimmicks. No attempt to tart it up as something it isn't. 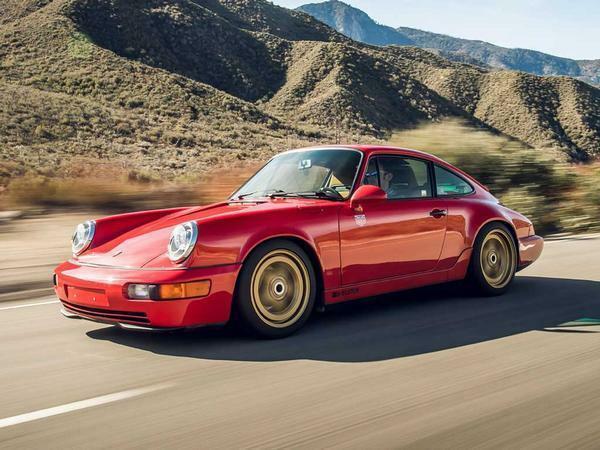 Simply an honest, air-cooled Carrera with a carefully considered package of upgrades to make it go harder and put a bigger grin on the driver's face. And patina suggesting it does just that on a regular basis. Angeles Crest Highway is exactly the kind of place to test the theory, too. There's apparently tacit acceptance of its status as some sort of Californian Nordschleife at weekends, though crossing the central double yellows remains a no-no. Nor do you want to be running wide on the outside of corners, the drops sufficient that the laws of gravity will deal you an even harsher penalty than those issued by the Highway Patrol. Plenty to focus the mind and test a car like this in other words, the fact it's mid-week and pretty much deserted probably for the best. Lesson one, this is not a car tolerant of a light touch or lack of commitment. Half-hearted throttle inputs send ugly shunts through the powertrain while half-arsed gear changes result in jerky progress as the revs die between ratios. Steering so heavy it lifts you out of your seat at low speeds focuses your attention on setting the car up for corners in good time, especially given the choice between cliffs on one side and death drops the other. 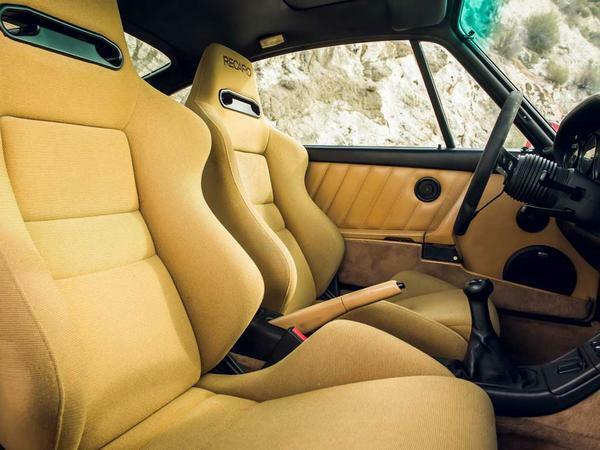 At a relaxed pace it'll mooch along on its beefier mid-range comfortably enough and there's enough stock 964 preserved in its character to drive it normally if that's your bag. But a road like this demands you raise your game. Which is exactly the point. Ross points out he could be travelling at twice the speed on the same road in the Sharkafied GT4 without raising a sweat. 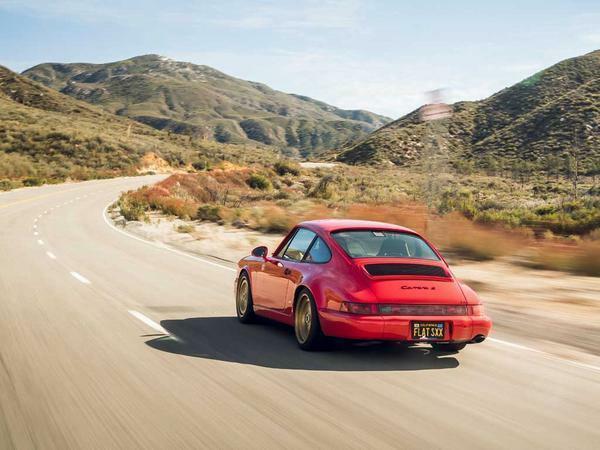 But with that out of his system he's had to look elsewhere for the same hit and, as a 90s child, the 964 stands out as his definitive 911 and obvious place to start his air-cooled adventures. There's more than a hint of RS-style rawness to the experience, the way the car comes to you the more you apply yourself to it the kind of reward you simply don't get in more modern 911s. At least not at speeds you'd be comfortable with on the public road. There aren't clear standalone details that leap out about the driving experience. It's more about the whole package. That lack of slack in the steering is matched to a similar feel in the brake pedal, those trick calipers biting immediately but building progressively the more pressure you put into them. That they offer this kind of power while fitting within period authentic 17-inch wheels is another bonus. There's nothing flashy about the suspension beyond using proven kit and expert set-up, the ride combining absolute authority over the lumpy canyon roads with an instinctive sense of where the grip is around the car. With it comes confidence to lean harder and appreciate the undiluted feedback coming at you through the chassis and steering. And, oh, that steering. Porsche's EPAS is rightly praised, but the way you feel the tyres load and unload through the sinews in your forearms, while shifting cambers and road surfaces tickle your fingertips? It's a level of interaction no modern 911 can replicate. Meaning you don't go into a corner too hot because you can feel exactly how hard you can lean against the front end, long before the front-end push that characterises lesser 911s or over-confidence you get in newer ones. And with throttle response this sharp you can sense precisely when and how hard you need to be on the power to exploit the slingshot corner exit, the sensitivity in the throttle offering precision to relish, not fear. And this Sharkwerks motor is always there. Alex may laughingly describe the revised gearing as offering 'fake torque' but the fact you can haul from low revs, enjoy the richness of the mid-range and then steel yourself for the decisive kick from 5,000rpm makes it so exploitable. Third and fourth are all you really need, too, the easy throw back and forth flattering your footwork and helping to keep the revs on the boil between gears. It's a fully immersive experience, demanding of every ounce of concentration, application and precision. Put simply the output is only as good as your inputs and it's the more satisfying for it. 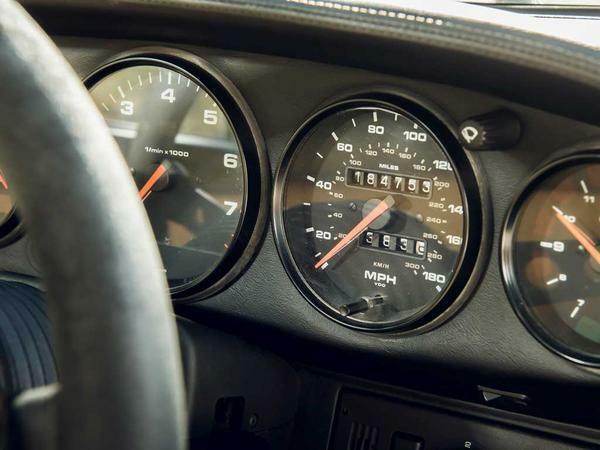 When your eye does glance the speedo the usual reaction is, "okay, that's not so bad" compared with the creeping dread of "oh god, not again" when driving a more modern Porsche with similar levels of commitment. Little wonder a number of customers with Sharkafied 997s have followed suit and bought 964s of their own. And that's the thing. Given its exploitable size and timeless looks, it remains curious how many people there are eager to turn these cars into something they're not. 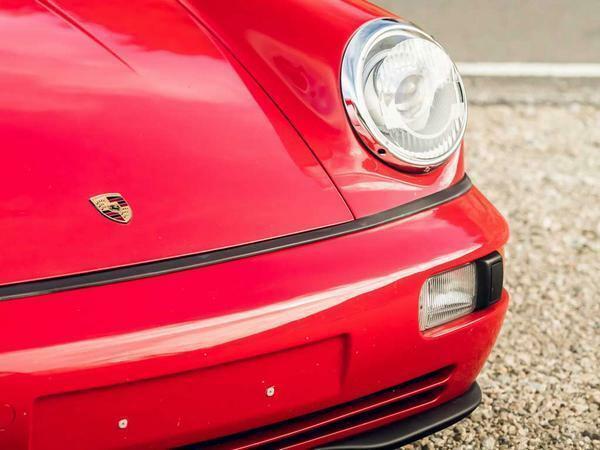 Hot-rod 911s come in all shapes and sizes to suit all tastes and budgets, but this one's faith to the original car's spirit is a lesson in how to do it sympathetically. New 911s are great. With the right tweaks there's still something to be said for making the older ones work that bit better too. Maybe it's only me but those wheels... just no. They take away from the overall look IMHO. I love modded "classics" like this; they show cars are for driving rather than buying as "investments". Other than this I find the whole classic car scene a bit of a bore nowadays. Wow, what a cracking car. I do love old 911s and Sharkwerks seem to do some great stuff. Shows how nutty prices have got. $60k to modify a C2. Ten years back I was offered a real RS that had only done about 10k for that! Yep but you can same about many cars and houses for that matter. As a keeper it still represents great VFM in today's market. Around £100k including car put it into newish GT3 territory but this will be the more engaging road car.